The African Centre for Studies and Research on Terrorism (ACSRT) in collaboration with the Spanish Government organized a three-day seminar under the theme “Counter-Terrorism in North Africa Region” from 2 to 4 April, 2008 in the Headquarters of ACSRT in Algiers – Algeria. The seminar brought together ACSRT Focal Points in North Africa countries, Niger, Mali, Regional Economic Communities and representative from the African Union. In addition, African experts in counter terrorism from Algeria, Egypt, Mali, Mauritania, Nigeria, Sahrawi Arab Democratic Republic, Tunisia and international experts from Spain, Portugal, Belgium, Italy, Sweden, United Kingdom, and United States as well representatives from European Union and International Organizations and Centres of research on relevant issues such as UN Office in Drug and Crime (UNODC), UN Interregional Crime and Justice Research Institute (UNICRI), Organization for Security and Co-operation in Europe (OSCE), Institute for Security Study (ISS) and Kofi Annan International Peacekeeping Training Centre (KAIPTC). The seminar was designed to discuss the threats and vulnerabilities in North Africa region and investigate the means of strengthening the capacity of counterterrorism in context of the AU Plan of Action on the Prevention and Combating of Terrorism. – Ambassador Boubacar Diarra, Director of the African Centre of Study and Research on Terrorism. H.E.M. Messahel applauded the remarkable effort made by ACSRT in taking the initiative of organising this seminar which is extremely timely and relevant since North Africa has recently seen another series of terrorist acts. 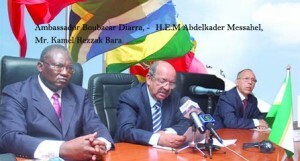 The Algerian Minister also stressed the persistence of H.E.M. Abdelaziz Bouteflika the President of Algeria on making ACSRT a Centre of Excellence serve African and International co-operation in the fight against terrorism. Spanish Ambassador Juan Casas, in his remarks, recalled the strong collaboration between Spain and the African Union, mentioned the challenges facing the African countries in fight against terrorism and argued that success in Africa is a global success. He also expressed the willingness of the government of his country to work together with the African Union and ACSRT. Ambassador Boubacar Diarra, Director of the ACSRT, delivered a speech where he noted the strong support expressed by the Algerian government to enable ACSRT to implement the AU Plan of Action on the Prevention and Combating of Terrorism. Ambassador Diarra outlined the role of ACSRT on the continental level to co-ordinate with Focal Points, centralize information, studies and analysis on terrorism and develop training programs by organizing seminars and workshops with the assistance of international partners. He also emphasized the AU commitment to build international partnerships to combat terrorism and to collaborate more closely with other international institutions on the matter. The nature of the trans-national terrorist threat needs for a trans-national response; he said. The Director of the ACSRT gave a general overview on the current state of the terrorism phenomena in the world and explaining the global and trans-national nature of terrorism commenting on the impact of terrorist groups on the region of Sahel; in this regard he urged African countries to take serious steps to consolidate their common efforts to fight against terrorism. The seminar included presentations by African and International experts demonstrating the terrorism in Northern Africa and its threats, vulnerabilities and impacts on the other regions. The plenary sessions were followed by panel discussions where the participants identified the threats and vulnerabilities in North African countries. The seminar provided an opportunity for the international participants to establish a deeper understanding of terrorism in North Africa, the evolving nature of terrorist activities on the global and local scale and the impact of this phenomenon on the global security in Africa and in the foreign countries. The group discussions were concluded by a list of recommendations in which participants summarized the seminar’s findings and identified priority and necessary actions should be taken to enhance the capacity of the African states in counter-terrorism in the context of the AU Plan of Action. This event will be followed by a seminar in Republic of the Congo under the theme “Counter-Terrorism in Central Africa” from 26 to 28 May, 2008.